These sleeves are a really great and affordable way to keep your credit cards safe. The price is only 4.99 for a 2-Pack. Well worth it for the protection and privacy it offers. Slim enough to allow cards to still fit in a wallet! Don't let identity theft happen to you while traveling. 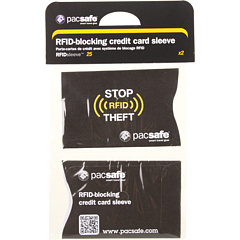 Keep your credit and bank cards secured with these RFID blocking sleeves. Set of two sleeves that are slim enough to allow cards to still fit in a wallet.